The most extensive assessment of migration ever produced shows immigrants now comprise a quarter of London's population and in one area - Wembley - just over half of residents. BBC News website's Steve Hawkes visited one street to witness multiculturalism in action and ask the people of the area whether it is working. 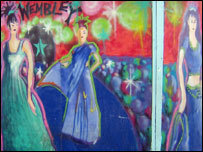 "Going to Wembley" is a phrase that makes most English people think about their local, or national, football team. The very name has become synonymous with English sporting success - FA Cup glory, 1966 etc. But the twin towers have been toppled, and in the shadow of the new stadium's triumphal arch being British-born makes you part of a minority. Most people in Wembley today were born abroad - 52% to be precise, more than anywhere else in Britain. Here you find a Kenyan running a halal Chinese restaurant, a Sri Lankan with a Polish delicatessen and an African police community support officer who speaks Sanskrit but wants asylum seekers sent home. A single street boasts an Islamic bookshop run by a man from Wolverhampton, an Asian funeral director from Africa and a black British estate agent who says the area is becoming a "goldmine". Arriving at Wembley Central, a train carriage contains one woman wearing a sari, another hidden in a hijab headscarf and veil. A man shouting into his mobile phone sports a pinstripe suit, another a Brazilian football shirt, a third a New York Yankees baseball cap. Along the High Street shopfronts promise everything from Afro-European and Asian hair products to acupuncture. On the corner, an Irish pub marks the start of Ealing Road, where mock Tudor and Georgian terraces rub shoulders with halal butchers and Bollywood video shops. Within 100 yards there is a Mosque, a Methodist church, a Baptist chapel and a Gospel centre. Sri Lankan, Pakistani and Indian restaurants of all descriptions compete with sweet centres, sandwich bars, bhel poori stalls, paan shops, fried chicken takeaways even a Gujarati pizza parlour. 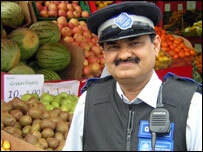 One man who knows more than most about the diversity of Wembley's population is Dhaqone Ragi. Born in Somalia, he speaks Arabic, Italian and English, and runs a small shop packed with phone booths, where a constant stream of people from all over the world queue to ring abroad using the international calling cards he supplies. His surname is pronounced with a hard "g" - but the many Sri Lankans and Indians he serves call him Rajid. At the age of 36, Mr Ragi is now a British national - but in 1990 he was smuggled into the country after fleeing civil war in Somalia. After applying for asylum on arrival, he was granted temporary admission, then exceptional leave to remain, a permanent stay and finally, in 2001, nationality. Initially housed in a hostel in Ealing, he has stayed in north London ever since. "I like it in Wembley," he tells BBC News. "I am safe here. "Other countries imprison refugees - but this country is humanitarian and we are welcome." Most Somalis in the area arrived more recently and are still integrating into British society, according to Mr Ragi. But having "started from scratch and worked hard to build a business", he feels very much at home. 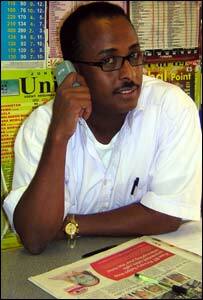 Most of his customers are phoning the Indian sub-continent - but many are Somali and a growing number Algerian, Mr Ragi adds. "I deal with everybody - Christians, Muslims, Jews." 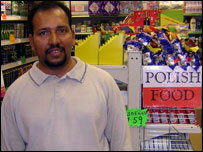 Unfortunately the expansion of the new Wembley stadium project means Mr Ragi's shop will soon have to close. But with three of his four British-born children at school in the area, he is keen to find another premises nearby. Abdul Ghafoor, 40, was born in Wolverhampton after his parents moved to Britain from Kashmir. The owner of an Islamic book selling business, he moved to Wembley 10 years ago because of its large Muslim population. "Business is good, so I am happy," he tells BBC News. "I love to see a multicultural society. "I like to meet different kinds of people and am very, very broad minded." His parents now want to return to Kashmir - but, although he holidays there every year, Mr Ghafoor says he will never leave Britain. "I was born here so I will always love this country." And he hopes the new stadium project will encourage more white British people to move back to the area. "I would like to meet more English people. "But many have moved from here, so maybe they do not like to mix." Ezra Evans, 20, says a recent influx of immigrants from eastern Europe has made the area more racially mixed. He was born in north London, after his parents moved to Britain from Jamaica, and has lived his whole life in Wembley. "I have no problem with anyone's racial background," he says. "It is nice people feel comfortable to come here - why shouldn't they?" 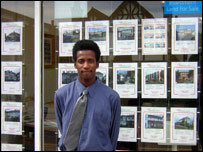 And as an estate agent, Mr Evans has more reasons than most to welcome Wembley's multiracial make-up. "It makes my job more interesting - adds flavour." "People of all nationalities want to move here from all over the world - and we are making the most of it. "This area is a goldmine." The eastern European immigrants are also welcomed by Sri Lankan-born Subramaniam Mahenthrian, 38, who has opened a Polish delicatessen. "Everybody was targeting the Indian and Sri Lankan market - so I went for a change," he tells BBC News. Poles and Russians make up 40% of his customers - the rest are British or Indian. Mr Mahenthrian came to Britain as an asylum seeker in 1999. Today he is a British citizen. His wife followed him to the UK and many of his Sri Lankan schoolfriends now live in Wembley too. Another businessman capitalising on Wembley's culture of diversity is Kenyan-born Nimroy Somaia, 38. 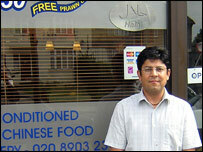 Half Gujurati and half Bengali, he runs "the only halal Chinese restaurant in north west London". "Most people round here like to eat spicy food full of flavour," he tells BBC news. Another British national born in Kenya, Ashwin Galoria arrived in north London with £100 at the age of 16. "It was tough going," he tells BBC News. "I worked as a warehouseman and studied in evening classes." Today, Mr Galoria, 45, who speaks Gujarati, Hindi, and Sikh Punjabi as well as English, runs an Asian funeral directors. "We cater for all faiths," he tells BBC News. 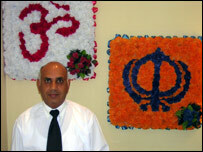 Hindus, Sikhs and Tamils make up 90% of his customers - but he also arranges Muslim and even Christian funerals. "It is part and parcel of serving the community," he says. Police community support officer Bhupen Buch was born in Tanzania in 1954 and spent 25 years in India before moving to Britain "for a change". He speaks Gujarati, Hindi and Sanskrit, but confesses to having had to "brush up" on his English before going on the beat. Mr Buch has had to break up fights between Tamils and other Sri Lankans as well as between Hindus and Muslims. But he feels safe patrolling the streets on his own and does not carry a truncheon or handcuffs. Most of Wembley's immigrants are law-abiding, according to Mr Buch. But there is one minority he would be happy to see the back of. "Most of the problems are created by asylum seekers. "They spend our tax money on drinking beer. "They must go. "They must all go!"